It’s time to publish the first run of statistics derived from the two cyber attacks timeline of January (Part I and Part II). In particular these are the first ones calculated with the new taxonomy that i have just introduced for 2018. 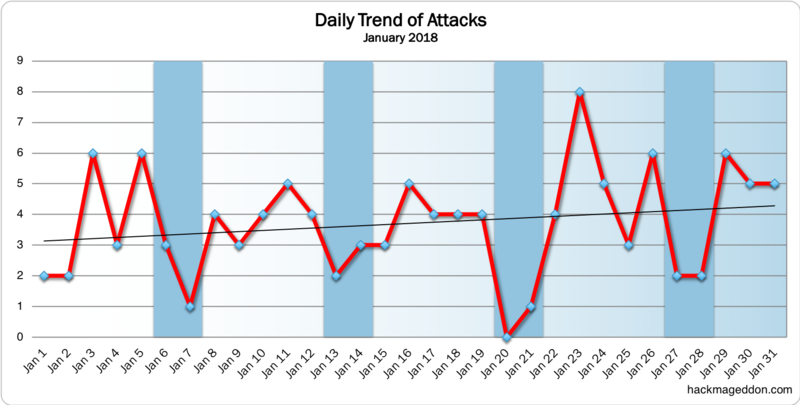 This month has recorded a long list of attacks (115), especially in the second fortnight, and this is obviously reflected in the Daily Trend of Attacks chart. The trend line is clearly growing towards the end of the month, with a peak around January, 23rd. This beginning of 2018 opens exactly the same way as 2017. Cyber Crime opens the new year on top of the Motivations Behind Attacks chart with 81.7% (it was 84.6% in December 2017). Cyber Espionage grows to 12.2% from 9.9%. It is interesting to notice also the 4.3 achieved by Cyber Warfare (it was 1.1% in December) and due by the wave of DDoS attacks against Dutch banks and institutions. from 13.1%. The chart is closed by Hacktivism with a tiny 1.7% (it was 4.4% in December. Malware hits a new maximum in the Attack Vectors chart with 43.5% (it was 36.3% in December), once again ahead of accounts hijackings (14.8% vs 18.7% in December) and targeted attacks (9.6% vs 8.8% in December). The attacks against Dutch banks and institutions push DDoS at a remarkable 6.1%. And in the next chart (the Distribution of Targets) you may notice the new taxonomy. Similarly to December, single individuals lead the Distribution of Targets chart with 40% (it was 36.3% in December). A direct comparison with the other targets is not completely possible even if ‘Human heallth and social work activities’ rank at number two with 9.6%, similarly to what happened in December when the same position was taken by healthcare with 11%.